7. Who is riding on the horse in the centre of the piazza? 8. What is this place? 11. What is the name of the river in Rome? 12. What bird is this? 14. What building is this? 15. This is the church where you saw your first Caravaggio painting and where Dan Brown takes you to a chapel inside in The DaVinci Code. What is the name of the church. 16. 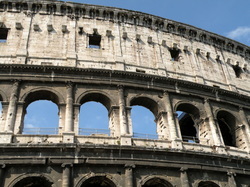 Name your favourite location in Rome that isn't included in this survey.